I’m not a believer in Valentine’s Day. Never really have been, honestly, and it’s not because I’m single (obviously). I’ve said it a few times on the blog in the past (like here and here), and it still hasn’t changed. One day dedicated to grand, overpriced gestures just makes no sense to me. I feel bad for the guys who feel the pressure to “Wow” their women on February 14, and I shake my head at the women who expect their men to go above and beyond for one day of the year. I say, if they want to go above and beyond, do something grand on a random Wednesday in the middle of March. That, to me, shouts love. Not a box of gross chocolates or gas station carnations. Kyle mentioned Valentine’s Day to me last week and how he felt he should do something for me. I told him that by no means did I expect – or even want – anything. I swear that in my head I’m not shouting, “YES! DO SOMETHING! BUY ME PRETTY THINGS!” It’s just not my thing. 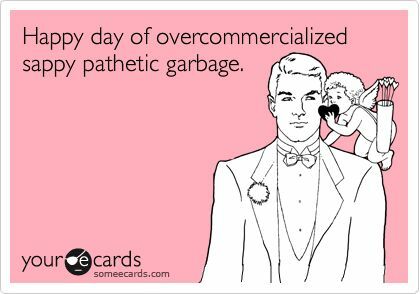 I appreciate loving gestures, but I don’t appreciate the pressure of a ridiculously over-commercialized holiday. Even Christmas is starting to get a little out of hand these days. I’ll end my annual Valentine’s Day rant there. I hope your Valentine’s Day brings to you whatever your heart desires, grand gestures or not. This year, Kyle and I wanted to have a simple and low-key Christmas. In the past, we always ended driving here, there and everywhere, visiting family to make everything “fair.” With the exception of a spaghetti dinner with my dad on the 23rd, we decided to host a get together with everyone on Christmas Eve. My mom & stepdad, Kyle’s mom & stepdad, and his aunt & uncle came up for post-dinner drinks and snacks and it was so nice. Everyone stayed for an hour or so and Kyle and I got to have a nice quiet Christmas day with Isla! And speaking of Isla – She got SO spoiled this year! She got two Little People play sets, a new wagon, table & chairs for her playroom, TONS of books, clothes, markers, colouring books, Playdoh, a huggable Elmo, a Magnadoodle … I’m pretty sure I’m forgetting stuff too. She’s so lucky to have so many wonderful people in her life! As for me, Kyle got me a brand new lululemon yoga mat (called “The Mat”). I’m super excited for this mat and can’t wait to use it in the new year! He also gave me a gift certificate for a tattoo (which he gifted earlier this month so I could book my appointment ASAP) and I’m SUPER excited/nervous for my appointment on January 3. I also got a really neat maple wood box carved from hand on Vancouver Island from Kyle’s stepdad (we do a Christmas name draw), and a load of gift certificates to my favourite places from my stepbrother. And my mom gave Kyle and I a vegetable steamer, which I’m really stoked on because I’ve been nagging to Kyle that I wanted one for a while, lol. After the presents were all opened, Kyle got the turkey all ready for the oven (yep, he cooked Christmas dinner!). It was absolutely delicious and I’m so grateful that he made dinner. (I have never cooked a turkey in my life) Isla didn’t like her turkey until I put ketchup on it. Yep, she’s going to be one of those kids. Yesterday Kyle sadly had to go back to work, so Isla and I went down to my mom’s for lunch and to visit my brother.